BAYTOWN, TX (KTRK) -- The third suspect arrested in the murder of two Baytown teens spoke to Eyewitness News Wednesday, just hours before hundreds of people packed a visitation for one of the victims. Jose Juan Chavez, 17, was arrested Tuesday. Police received a tip that Chavez was hiding in an apartment just a few blocks away from the police station. It took a SWAT team to get him out. Police say he's now charged with capital murder. On Wednesday, as he was being transferred to Chambers Co., we asked him if he had a message for the families of Jarvis Morgan, Jr., 17, and Alejandro Castillo Chavez, 18, whose bodies were found in Anahuac last week. His answer -- "I'm sorry." The victims were found in a bayou after investigators say they were kidnapped and killed and their bodies dumped. Police say they don't know the motive or cause of death just yet, but they believe the victims and suspects got into an argument the night of the murder. At her son's visitation, Alex Chavez's mother, Mariana Castillo, said, "I'm hurt because they took my son's life. I will never forgive them." Both Richard Gonzales, 21, and Valentin Lazo, 27, have already been charged with capital murder. "We don't believe this was gang related," said Bayton Police Asst. Police Chief, Roger Clifford. "We believe they all had some kind of gang affiliations. We know there has been some drug usage among all the persons involved in this, but we don't believe this was drug related. There was something other, very personal. This was a very brutal murder." 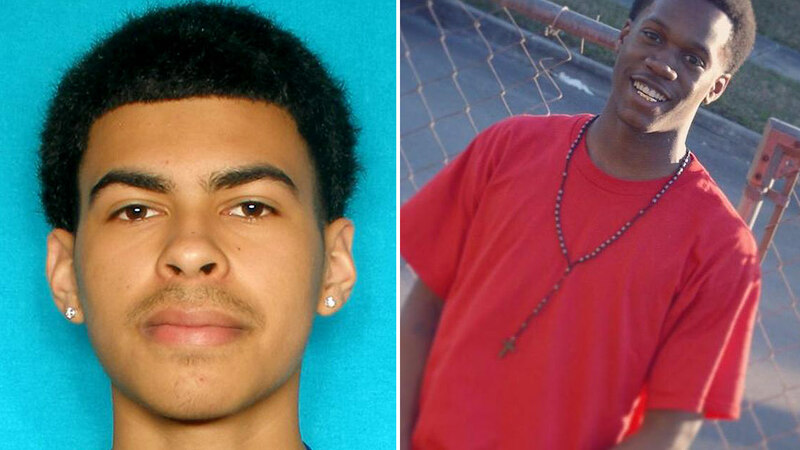 Brandon Flores, a fourth suspect charged with capital murder, is still on the run. Police believe he may have fled to Mexico, where he has family. The U.S. Marshals are now involved in an international manhunt. "He is our main person," Clifford said. "He was probably the most aggressive in the death of our two victims and we'll leave it at that." On Monday, Chambers County Dist. Atty. Cheryl Lieck told Eyewitness News there's a chance more arrests could be made beyond the four men they've already connected to the killings. "We think there are possible other people involved," she said. "That's why we are running down every lead and why we need to talk to more people."